The What: Analog Way has introduced Pulse², a new versatile Mixer / Native Matrix Switcher. Pulse² is based on Analog Way’s new Midra platform, the core of a brand new line of mid-range Mixers / Seamless Switchers. The Midra platform consists of 6 products: QuickVu, QuickMatriX, SmartMatriX, Saphyr, Eikos and Pulse. Analog Way has renewed its line of mid-range Mixers Seamless Switchers with the Midra platform. Based on Midra, the Pulse² offers a new design and innovative functionalities, including some advanced features inherited from the LiveCore series, Analog Way’s range of Premium Presentation Mixers. The What Else: Compared to the Pulse, which was launched in 2009, the new Pulse² benefits from several major improvements, bringing the product to the next level. Pulse comes in a 2RU enclosure with a deeper chassis, ensuring better air circulation and cooling of the device. The product offers upgraded connectivity, through 8 seamless inputs and 14 input plugs: 4 x Universal Analog, 4 x DVI-D, 4 x HDMI and 2 x 3G-SDI plugs. Thanks to the CleanCut effect, the Pulse² can operate fast and seamlessly switch between any of its 14 input plugs without fade through black or loss of sync. EDID management is now standard for inputs 1 through 6 for computer sources. Pulse² features a matrix mode with 2 outputs. To fit any display resolution, including non-standard formats like LED walls and rear-projection cubes, Pulse² offers custom output format management. 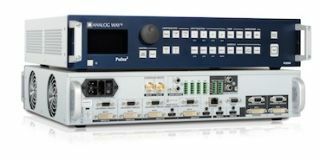 Thanks to optimized programming and a new architecture, the Pulse² offers Fast Seamless Switching, with a 50 percent speed gain in control parameter response. The de-interlacing process on the Pulse² was significantly improved, similar in quality to the process available on the LiveCore series. Pulse² offers two frame layers, with background and foreground positions. Thanks to the new Quick Frame function, a foreground frame can quickly hide all other layers when necessary. Preset management was also optimized, and the Pulse² offers smart functions such as Swap and Split. Available using hot keys, these functions allow users to switch between a PIP and a live background source (Swap), or the display of two PIPs side-by-side on a colored or frame background (Split). Major new assets available on the Midra generation of Mixers Seamless Switchers also include advanced management of audio and embedded audio. The Pulse² can easily embed or de-embed digital audio on HDMI and DVI-D connectors on inputs and outputs, ensuring better processing and quality of the video and audio mix.